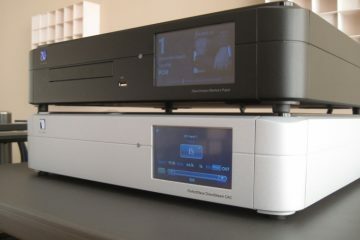 Leema may currently be most well-known for their excellent value Elements series (see the review) but it was their full size Constellations series that started it all, and recently the Libra DAC was added to this series. 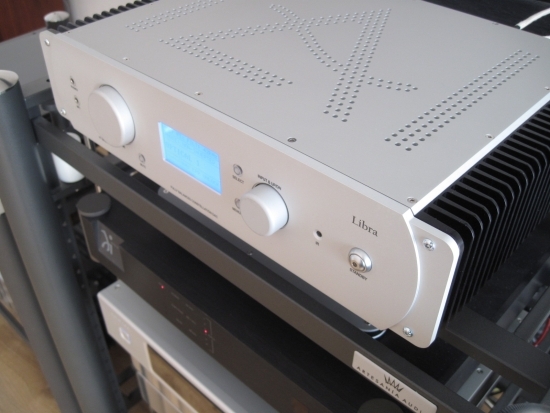 The Libra offers more inputs than the Elements DAC and is also capable of decoding DSD128 and DXD. It can operate as a traditional DAC with fixed volume output in collaboration with an external preamp, but it can also function as a DAC and preamp in one. It does not do this like most DACs, with a digital volume control, but with a proper analog volume control and 3 analog inputs on either RCA or XLR, and analog inputs remain analog. 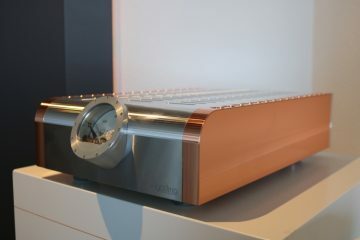 Naturally the Libra also offers the LIPS protocol so that it can control the volume and other functions of connected Leema poweramps. The Libra’s inputs can be freely renamed via its front panel display using the rotary knob. The more advanced features are set via the display but most important functions like volume control, input selection, mp3 mini jack input, HT bypass input and mute have dedicated buttons. 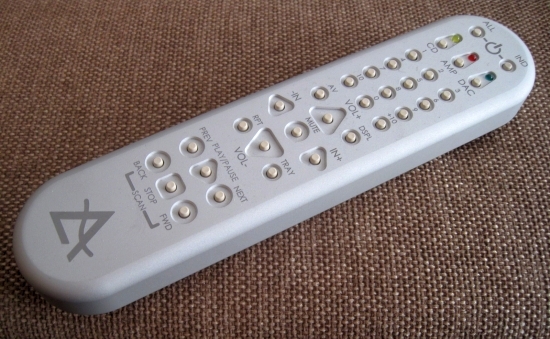 Above: the Libra comes with a beautiful remote control milled from a massive block of aluminium. All the important functions are there, including the AV input. An interesting feature is the possibility to choose between two digital filter settings, called normal and wide, or to choose an automatic selection based on the input signal. The manual quite correctly states that “some people prefer to listen to low sample material with wide filtering applied”. Selecting the wide setting puts the filter at 82kHz instead of 42kHz, which provides something of a technically correct alternative to the NOS or filter-less DACs that are popular lately. 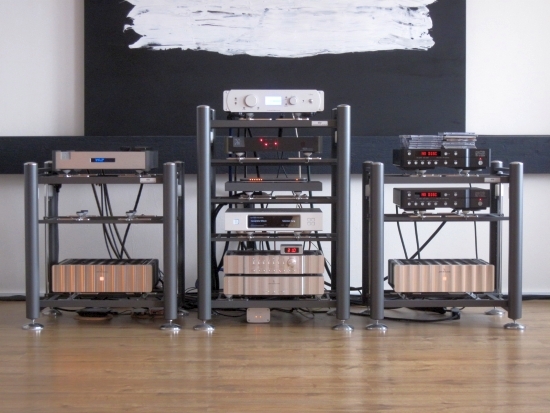 One can use the Libra as a standard DAC, with volume control or fixed output, but thanks to its extensive range of inputs, the Libra can also function as a fully-grown preamp which means that a traditional preamp can be skipped which greatly reduces the Libra’s perceived cost. Importantly, the Libra’s analog inputs remain analog throughout, they are not digitised and converted again at the output. This means that in addition to being a DAC, it is also a true analog preamplifier. Historically my system sounds best with a preamp in the chain, because this adds a richness that I feel my speakers really need. Still, removing a preamp from a chain is bound to produce a cleaner signal, and this is indeed the case. 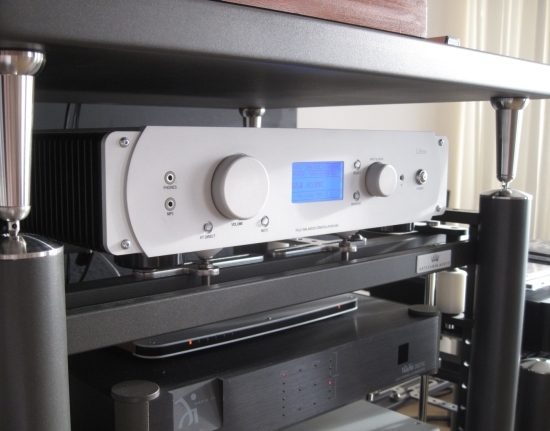 Direct to the Jeff Rowland model 6 poweramps the sound is more sober, but tighter, faster and cleaner, and the Libra’s analog volume control works splendidly. 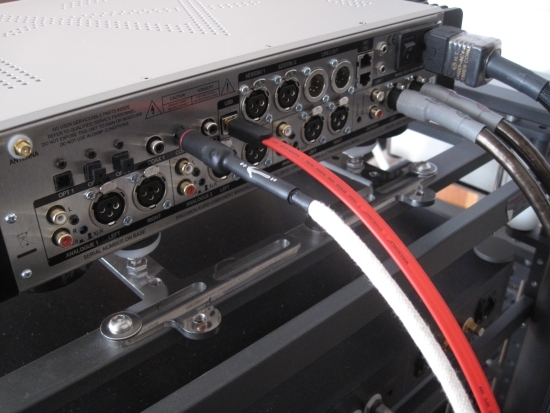 In addition to the traditional digital inputs such as S/PDIF and TOSlink (three of each) and two AES/EBU inputs there is also a USB input that utilises Leema’s own asynchronous M1 USB interface that is galvanically separated from the rest of the unit by means of a technique that Leema call “spinning electron”. Additionally there is a built in Bluetooth module for playback from an Apple or Android device. Finally there are two I2S inputs enabling separate transport of audio and clock signals, avoiding the encoding and decoding to S/PDIF. Leema’s implementation of these I2S inputs is especially interesting because while there is a standard, not all manufacturers adhere to this. 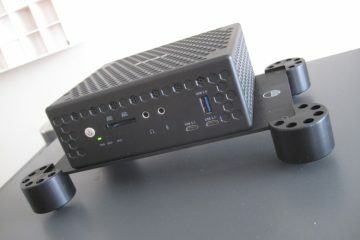 That is why Leema has chosen to make one of the two inputs’ pin configuration adjustable in software, which should allow all I2S transports to be connected. As is normal for any DAC, the different inputs all have their specific sound signature, but this is also dependent on the device they’re matched with of course. As the main source I use an Aurender N10 music server and it is with this server that I experience the least obvious differences between its various outputs such as S/PDIF on coax or AES/EBU and USB. This is what makes it a perfect source for assessing components down the line. Most of the time on a given DAC the USB input sounds most precise/tight/fast, which makes sense as it is the only input (besides I2S) that doesn’t encode data and clock into a combined S/PDIF signal. 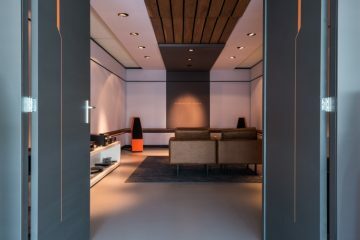 Whether or not one prefers this sound is a personal matter, and also dependent on the DAC’s inherent sound, one’s system and one’s personal taste. With my current system’s tendency for fat bass I tend to prefer tighter sounding components, and thus usually prefer USB. However this is also dependent on the USB cable used. Using my long time reference AudioQuest Diamond USB cable, the Leema’s USB sound is slightly less articulate than any of its other inputs (not counting Toslink). Using the supplied Wireworld Starlight 7 USB cable however, this effect is reversed, USB now sounding tighter and slightly more focused. A very interesting alternative was found in using the coax input with a Mad Scientist Heretical digital cable. Even if I was now comparing Asynchronous USB with S/PDIF, the latter has a certain rightness to it. More refined than the Wireworld USB cable and more lively than the AudioQuest USB cable it seems to strike the perfect balance. Swapping the N10 for the Levinson no.37 CD transport revealed the known differences between the two source kinds: a more romantic but slightly rounded sound with softer transients for the transport. While certainly appealing, I prefer the N10 for its combination of superb transparency and tightness with excellent low level detail and decay. It’s funny but during the Leema Elements review I think I was still in two minds about the music server versus CD player matter, but these days I actually don’t use CD’s much anymore. I have Evert of AudioAanZee to thank for his Reference Flow that started this trend. Bluetooth works quickly and flawlessly and with zero dropouts during my tests with an iPhone 6, but as expected, thus input does not provide the highest sound quality. This is only normal due to the format’s inherent bandwidth limitation and having the option is certainly a benefit in itself. For the remainder of the review I used a Mad Scientist Heretical cable between the Libra’s coax 2 input and the Aurender N10. Above I mentioned the filter settings “normal” and “wide”, and experimentation quickly proved that there are clearly audible differences between the filter set at 82kHz or at 42kHz. Even at 42kHz the Libra sounds, well, liberated, from digital artifice. But when switching to 82kHz treble becomes even more airy and refined. It’s lighter in touch and less forceful, but I like that in digital replay. Midrange, too, becomes more beguiling and lyrical in the 82kHz setting, while loosing out nothing in bass firmness or articulation. Needless to say, I kept the Libra in the 82kHz setting. 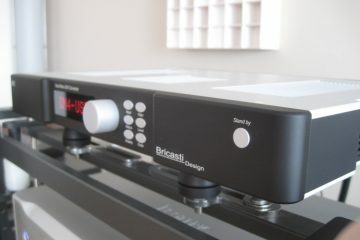 Like the Elements DAC, the Libra seems to work best on a solid foundation and used with neutral and articulate cables. But due to its higher resolving power, smooth sounding cables also worked splendidly with the Libra, a Taiko Audio Nagado powercable and Transparent Ultra interlinks lending a very rich and seductive, extra-smooth sound to the Libra that was also hard to resist. In my system I found the best match was achieved with a Reference Tweaks Gold Label powercord and Cardas Hexlink Golden 5C interlinks. This gives the Libra most expressive power in the midrange, and the most convincing tonalily. From what I heard during the Leema Elements DAC review, I have no doubt that the Cardas Clear interlinks would have worked even better, but alas, these cables are no longer at hand. After returning to the car from eating out we found the windows smashed in, and the bag with various cables, Cardas Clear included, missing. 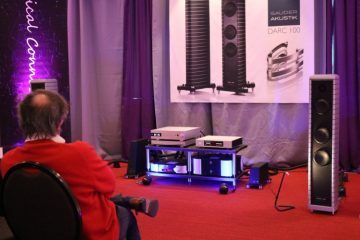 The Gold Label powercable incidentally is based on Furutech Alpha 3, which also worked spendidly with the Elements DAC. In the more affordable range I also have at hand the AudioQuest Water cinch interlinks which also made for a very good match. Like the Clear and Hexlink, the Water has superbly natural and convincing timbre, which matches the Libra’s analog-like character very well. While one has to be careful drawing conclusions that involve interplay with the component down the line, I have a feeling that the Libra’s XLR outputs sound more powerful than the cinch outputs. This is more common I find, so if you can employ balanced cables, this would be preferred. I’m not sure how much DNA the Libra shares with the Elements DAC, but judging by ear it seems that they have taket the entry model’s incredibly musical character as a starting point, and added a healty dose of audiophile ingredients to arrive at a DAC that has the same relaxed musicality but with greater transparency and finesse. Like the Elements DAC, the Libra has a decidedly non-digital sound without any edge. However, it’s quickly evident that the Libra is much more refined than its cost effective stablemate. There’s superb transparency top to bottom and excellent low level detail, but never in an etched or analytical manner. There’s none of the “appeal to the brain but not to the heart” kind of sound. Likewise, focus is definitely more coherent than with the Elements DAC, but still presented in a relaxed manner, and not at all beamy. While treble with the Elements DAC lacked the air and finesse of the Ayre QB-9, the Libra’s airy and fluid treble is on par with the best I have heard, and that includes the Accuphase DC37 and EC Designs filterless Mosaic DAC. Arguably the place where the magic happens is in the midrange, the Libra possessing a marvellous mix between a full smoothness with a forgiving nature and excellent resolution. 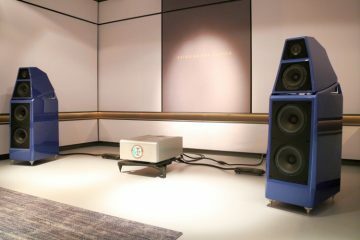 But the midrange is only as good as the upper bass that connects to it, and here too the Libra performs splendidly. There’s a nicely full and weighty bass that lends body and substance to the midrange. While not as articulate as dCS- or Wadia bass, the Libra’s bass certainly not slow or overly creamy, but it is very slightly rounded and so it is important to use cables that complement its sound. Sometimes descriptors like “un-digital” or “relaxed” can also imply a certain lazyness, or worse, a lack of PRAT. Not so the Libra. In fact the Libra has a beguiling presentation and is highly lyrical, with excellent dynamic differentiation. Vocals and instruments like guitars really flow from the speakers effortlessly and beguilingly. 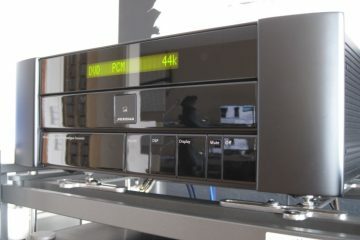 In anticipation of an upcoming review of the Wadia 322 DAC, I loaned the Wadia 25 DAC that I sold so long ago to a friend. 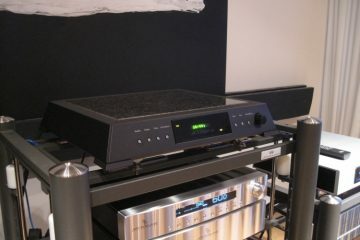 It was interesting to hear my old DAC again after it has been in storage basically for 10+ years at my friend’s place. 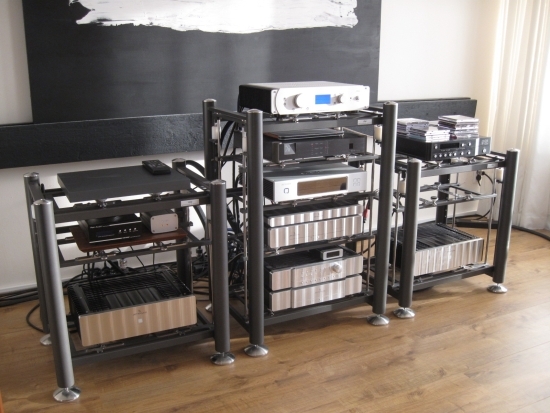 The 25 was my first really serious DAC, the first being the Wadia 12. 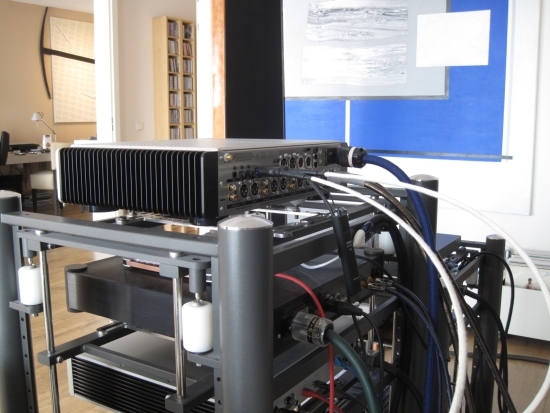 My system at the time really wasn’t very forgiving and the Wadia’s typical dry and dark treble didn’t integrate well. The Martin Logan SL3’s were too old and their treble was rolled off, while the lack of preamp and Bryston amplification made for a lack of warmth that was simply too much with the Wadia. My current system is almost the opposite of that old system and it is very smooth and forgiving. Right now the Wadia 25 sounds impressive in terms of bass power and definition and powerful delivery with very acoustically believable timbre. The treble however is still borderline acceptable, but at least my Apogee Diva speakers have excellent treble air which compensates somewhat for the Wadia 25’s darkness. Switch to the Libra however and it is immediately clear what’s missing from the 25. The Leema’s treble is so much more airy, so much more extended and so much more refined. In addition, the Libra has considerably better resolution in terms of low level detail. Midrange presentation is quite different between the two too: slightly forward and live-like (not necessarily life-like) with the Wadia and more luscious and humane with the Leema. I find that because of its more “solid” quality sometimes the Wadia makes music sound more realistic than the Libra, but with other music the situation is actually the reverse with the Libra sounding more lifelike because of its freer delivery, so even if the midrange delivery of the DACs is quite different, this is a bit of a tie, and up to personal taste. The main deciding factor is in the solidity bass, where the Wadia has the upper hand as usual, but whether or not the trade off is worth it is a personal matter. This diminutive DAC is an art of minimisation: there is no oversampling, no digital filter and the DAC drives the output directly. This was the DAC that challenged my Jeff Rowland Aeris DAC in terms of analog ease, resolution and treble refinement. Even if the Mosaic did not beat the Aeris on all accounts, I did sell it as a result. The Leema Libra however manages in turn to beat the Mosaic on all accounts! It has even airier treble, much fuller and beefier bass, a more expressive midrange and an altogether more powerful delivery. 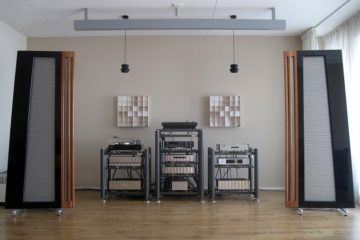 Importantly, the Libra sounds every bit as “analog” as the Mosaic and has an even more “free-flowing” quality. My renewed interest in Wadia brought me to seek for the 521, and when I saw one in near-mint condition, I just had to have it. The 521 is the last Wadia made by the original Wadia team in the period 2007-2014, prior to the takeover by Fine Sounds. It utilises the exact same circuit board as the s7i, but I find that the standalone DAC sounds quite different from the player. The difference surely must be in the transport section. But this is for another review. The 521 combines the best of the classic Wadia sound (a la 25 as described above) with newfound refinement and resolution, especially in the upper midrange and the treble. Overall the 521 sounds richer and more luxurious than the 25, but it retains the firm bass and acoustically convincing midrange. 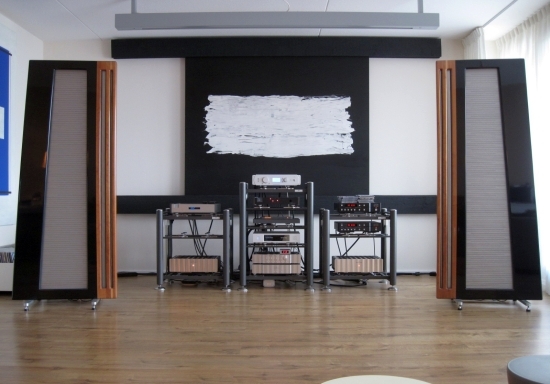 It is precisely here where the biggest differences between the 521 and Libra are: the Wadia scoring points in focus, timbre and lifelike, believable real-person portrayal of voices, and the Libra sounding altogether more lush and relaxed. They’re both equally capable in terms of emotional conveyance and lyrical presention and both are very appealing renditions for different reasons, and system synergy will be the main deciding factor between the two. 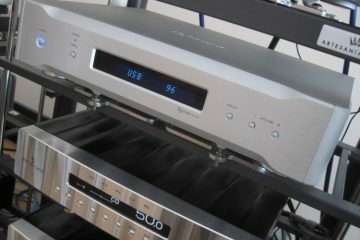 In the Leema Elements review I wrote that it sounded almost as good as the Mark Levinson 390S CD player. Back then, the 390S was still better in terms of articulation and overall power. 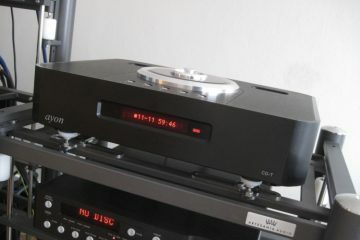 Meanwhile the player has been treated a new CD-Pro2 transport and is again in super-condition. This time around I can only say that the two sound remarkably similar, especially with the Libra in its 82kHz setting. To properly test this, I connected the Heretical digital cable from the Aurender N10 alternatingly between the 390’s digital input and the Libra’s coax 2 input. There still are slight differences but they’re so small as to be meaningless. The important thing is that both DACs were equally lush and lyrical in their presentation, which I feel is a big score for the Libra, especially considering the ongoing trend of ever-cleaner sounding DACs. This 322 DAC was released in 2016, so from after the Fine Sounds takeover, which could be said was started with the 121 DAC. I planned on including it in this review, but its delivery has been delayed several times, and it is now time to conclude this review. If the 322 arrives before the Libra has to go again, then I may still add an update. While its exterior design may be controversial and not to everyone’s taste, at least Leema dares to be different. The Libra’s sound is also different from the norm, which in my experience still revolves around ever cleaner and more astute sound. Not so the Libra. It has all the detail and refinement one can wish for but it presents this in a musically meaningful manner, with the performance intact as a whole. There’s a lushness and sense of analog continuity like I rarely hear it in digital. Importantly the Libra is not downtempo but instead highly lyrical, with excellent dynamic differentiation. 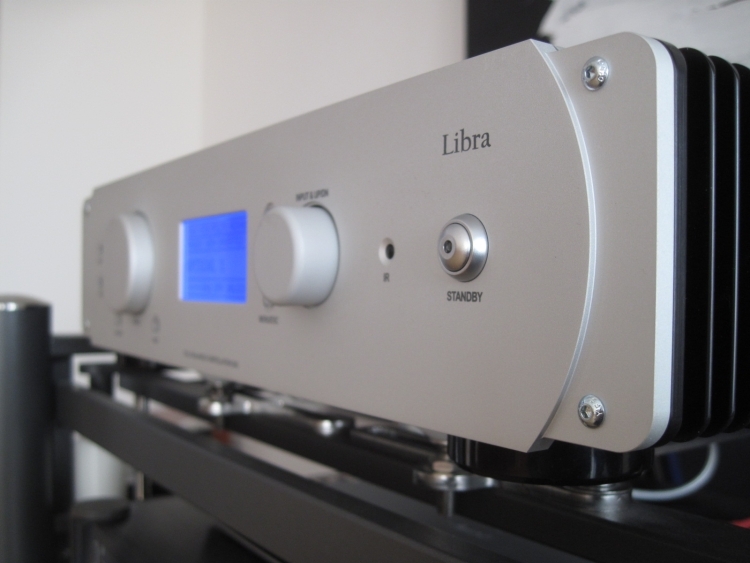 Tonally rich and entirely stress free, the Libra is one of the most un-digital sounding DACs I know of, making you forget about the technicalities and letting you focuses on the soul of the music. While 7800 euro may seem like a steep price, one really has to factor in the plethora of digital and analog inputs, and the true analog preamp functionality.